With Congress out of contention in several areas, it’s going to be a 2-way fight in most seats. In 2017, the three-tier panchayat elections saw the BJP’s position rise from 36 seats in 2012 to 296 –– an almost tenfold gain. 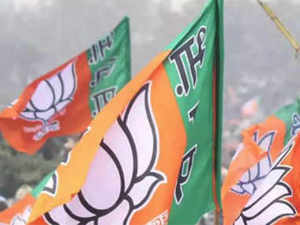 BHUBHANESWAR: The BJP is counting for gains in Odisha despite the reversal in 2014 during a nationwide ‘Modi wave’ largely due to a massive push over the past five years to strengthen its organisation. The BJP claims that its membership alone has grown by 12 times in this period. In 2014, the BJP won just 21.5% share of the Lok Sabha votes and only one seat, Sundargarh, was won by a narrow margin by minister for tribal affairs, Jual Oram. The BJP stood second in nine of Odisha’s 21 seats and was second or a distant third in the rest of them. It got only ten of Odisha’s 147 assembly seats. But things have changed with Naveen Patnaik himself acknowledging the BJP to be a contender. The party also decided that it needed to change its strategies. “Earlier, we used to hold protests and dharnas at the state level. Then, we decided to hold campaigns at the mandal level, across 1,000 gram panchayats. We had three kinds of campaigns: misgovernance of Naveen Patnaik’s government, local issues, and public meetings on these issues. We would conduct such dharnas at least three times. Then, we’d have one big andolan at the gram panchayat level. After six months, we would have one big protest at the state level.” This helped them catapult into the opposition space at a time when the Congress was quite inactive. In 2017, the three-tier panchayat elections saw the BJP’s position rise from 36 seats in 2012 to 296 –– an almost tenfold gain. To take the message to the voters, the party held its national executive in Bhubaneswar that year. Meanwhile, Naveen Patnaik gathered his partymen for an introspection, reshuffled his council of ministers and stepped up his defence strategies. In February, 2018, a crucial bypoll was fought for the Bijepur assembly seat in Bargarh where paddy cultivators were furious with the government over many issues, and where the BJP had 25 out of 34 zilla parishad seats. Patnaik used all the resources at hand and let everyone know that he wasn’t going down without a fight. The BJD won with a margin of more than 40,000 seats and was able to counter the BJP. It ensured that it won every bypoll after that. Modi made frequent visits to the state. And when he did he’d mention Veer Surendra Sai, the tribal leader who fought the British, Buxi Jagabandhu who led the Paika Biidroha tapping into issues related to Odia pride and identity. Party president Amit Shah paid half a dozen visits just to meet karyakartas. The big political decisions, such as taking in former BJD leaders Baijayant Panda and Damodar Rout, were left for closer to the polls. Half a dozen MLAs and four MPs joined the BJP and “one or two of them were not even tickets,” Singh said. He added that the party had also put up former Odisha DGP Prakash Misra as its candidate in Cuttack and in Bhubaneswar, its former Odisha cadre bureaucrat Aparajita Sarangi was fielded –– both of whom were not in politics earlier. “For the Lok Sabha, you need credible faces, so it’s a mix,” Singh says. Modi believes that Odisha is heading the Tripura way (where popular long-time CM Manik Sarkar was voted out because people wanted change). With the Congress out of contention in many constituencies in coastal Odisha, it’s going to be a two-way fight in many seats. With no CM candidate projected, it is Modi versus Naveen Patnaik.